When we put an opus of the label Ultimae Records in our CD player, we have to expect an explosion of tones which bloom in a mosaic of rhythms constantly pulled by the various essences of Electronica. Although closer of psybient than of psybeat, “Granite” reaches the sound panoramas aimed by the Lyon based label. Third opus of Martin Van Rossum, “Granite” is a real story of patience for those who wait for rhythms and of delight for those who like the color of the sounds. Inspired by natural rocks (sic! 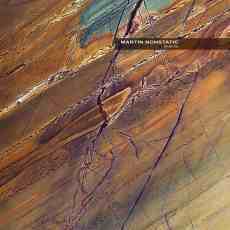 ), this Martin Nonstatic's album can turn out to be a real jewel for those who like sounds, sound effects and chain of sounds which eventually end by structuring the impossible. For others, like me, who wait for crescendo of ambiences to make shiver our soul, will rather have to look for the lush soundscapes of this album where we hear unmistakably the rocks to explode in surprising concertos of surrounding noises. And that begins with a shower of crackling which falls down on synth lines misted of morphic choirs from where escape long sonic strands of which the forms are similar to these abstract figures that we blow with some soapy water in a hoop. We have here the main carpet of parasitic tones, certain will be also very organic, which enclose the 12 sonic chapters of “Granite”. That gives a dark, some people will think of the dirty alleys in Blade Runner, and psychedelic look in the various structures of rhythms which roam all over Martin Nonstatic's first opus on Ultimae Records. And the one of "Bowed Thoughts" is rather of a ambient hip-hop kind. The sound hoops weave an aura of psybient while the pulsations, which abound in very nice copies in the crackling tones, shape a hopping rhythm which is constantly questioned by the sound turbulences and the atmospheres which emanate from it. The title-track is livelier with a line of sequenced pulsations which gallops in a celestial water from where escape a legion of doubles of which the shadows sculpt a kind of detachable rhythmic skeleton. That reminds me enormously Eddie Jobson's work on Private Music, Theme of Secrets back in 1985. The synth layers draw some threatening shadows which undulate with hoom hoom in their wings while the structure of rhythm is feeding of these pulsations which fall to pieces and get together again in continual and short-lived loops of rhythms. A sound phenomenon completely charming for the ears which also feeds all the phases of ambiences in “Granite”! Strikings of bass-drum resound and do like these sniffer dogs which frighten the partridges by raising chattering balls which shiver with the coldness of the metal's spasms. The movement turns for a good morphic techno where the gestural is more quiet than the cerebral. "Inside EyeSight" follows the course of "Granite" with a kind of ambient dub where the angles of metals rub themselves and make the sound shivering. The movement becomes more fluid here and reminds me of these good moments of Plastikman's lunar trance with all the psychedeli-cosmic setting which that implies. It's unarguably the most vivacious moments of this “Granite” which afterward falls in a long psybient phase with structures where the soft rhythms, which look strangely like these ambient hip-hop that certain people are capable to create by making noise with their throat, dominate the allegories of Electronica. Thus "Edelbitter" infiltrates our ears with a push of woosh and of wiish where scribbles a strange voice with a non less stranger dialect. The sound hoops collide their plasticized echoes while that some evanescent chords try to tame a shower of jingles which finds refuge on the back of a heavy crawling bass line. Rhythm, non- rhythm, broken rhythm and rhythm which resolder itself to dissolve again, as in "Open Minded", the sound embellishment of “Granite” respects in all points the standards of the Lyon based label. The first minutes of "Tabula Rasa" are flooded in these ambiences before offering a rhythm as discreet as these hits from our Adam's apple that we make resound at the bottom of our throat. The same goes for "Saint Germain" where the rattlesnakes make their concerto. There is also "Kurukshetra" and the legion of jingles (or are they rainy drops?) which bites our eardrums or still "Out of Silence" and its multiple bones which fall to pieces and gather again in a rather musical envelope. "Distance B" is the most lively down-tempo with floating riffs of guitars, I also heard those in "Tabula Rasa" by the way, and a delicious line of bass which crawls here in a so viciously way. Solid pulsations anchored in synth layers in tones of organ; "Samsara" is a good mixture of Dub and psybient, to say the least of what I know of this style. It's a rather lively piece of music which reminds me of Pete Namlook's visions of Electronica. I have to admit to have had a bit of reluctance after the first listening of “Granite”. I didn't really know Martin Nonstatic's soundplate, and I had not found during this first confrontation these elements which often create in the psybient this dose of crescendo which grows as the music passes. Here everything is linear. Martin Nonstatic throws at us a dozen of tracks traced over the same level of emotions where the wealth of sounds and the color of tones is by far the most charming element here. And when we know that this wealth covers the 71 minutes of this album, our ears are completely quenched. Except that I still have this little hole to fill in my soul.